Gilles Rézard discovered bluegrass music at 16. He started learning guitar, then fell in love with the banjo. He has recorded and performed internationally with several bands, and made a solo CD, “Wood, Metal and Skin”. 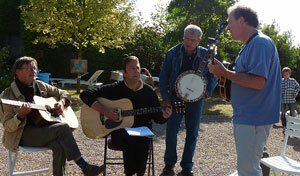 He now works full-time as a musician and teacher, in Igé, Burgundy and performs with Saga-Trio and Banjomaniacs. Gilles has taught hundreds of students (on banjo, guitar and mandolin) in 40 music camps in 15 years. To improve connections between French bluegrass musicians, he has created a map locating all who register by emailing him. "Gilles is a very good teacher, within reach and tuned to the students. He is very friendly and welcoming." "Thanks to Gilles I discovered the happiness of jamming." "Great teaching and attentive to each detail." "Relaxation, method, friendship, cordiality, theory, practice, serenity ... it looks like happiness ... Thanks to Gilles for all this!" "The atmosphere was wonderful. The slow jam work benefits everyone (from beginner to advanced). Gilles demonstrates a great pedagogy [teaching method]. He is attentive to everyone." You will be jamming the first session!